Taste test: These are some top-notch potato chips, with a great cajun barbecue-type taste and some good hot afterkick, on a very crunchy, crisp and delicious kettle-cooked potato chip. 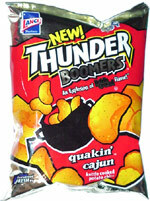 The hype on the Thunder Boomers bag sets some high expectations for these chips, and the chips actually live up to their promises. Smell test: Very nice cajun barbecue smell. Wow. This snack was discovered by Jeremy in Atlanta. Review published .